“An experimental campaign conducted at Lawrence Livermore National Laboratory’s (LLNL) National Ignition Facility (NIF) has achieved a total fusion neutron yield of 1.9e16 (1.9x1016) and 54 KJ of fusion energy output — double the previous record. Researchers in LLNL’s Inertial Confinement Fusion Program (ICF) detail the results in a paper that will be published this week in Physical Review Letters. 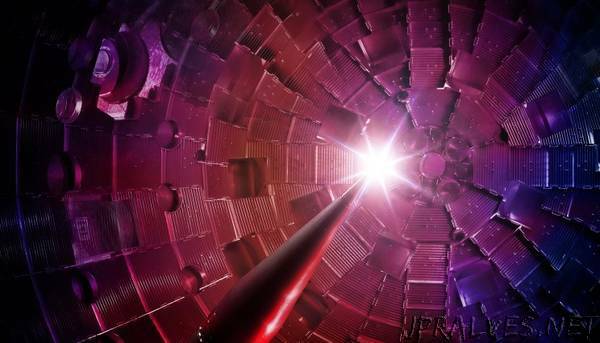 NIF is the world’s largest and most energetic laser, designed to perform experimental studies of fusion ignition and thermonuclear burn, the phenomenon that powers the sun, stars and modern nuclear weapons. As a key component of the National Nuclear Security Administration’s Stockpile Stewardship Program, experiments fielded on NIF enable researchers to gain fundamental understanding of extreme temperatures, pressures and densities — knowledge that helps ensure the current and future nuclear stockpile is safe and reliable. The record-breaking experiments utilized a diamond capsule — a layer of ultra-thin high-density carbon containing the deuterium-tritium (DT) fusion fuel — seated inside a depleted uranium hohlraum. This approach allowed the researchers to greatly improve their control over the symmetry of the X-rays that drive the capsule, producing “rounder” and more symmetric implosions. In addition to increased yield, the experiments produced other critical results. For the first time, the hot spot pressure topped out at approximately 360 Gbar (360 billion atmospheres) — exceeding the pressure at the center of the sun. Further, these record yields mean there was a record addition of energy to the hot spot due to fusion alpha particles. By depositing their energy rather than escaping, the alpha particles further heat the fuel, increasing the rate of fusion reactions and thus producing more alpha particles. This leads to yield amplification, which in these experiments was almost a factor of 3. As the implosions are further improved, this yield amplification could eventually lead to fusion ignition.